French photojournalist Jack Burlot was 18 when he began his career by covering the Vietnam War. He later covered various conflicts in the Levant. So it was quite a change for him to come to a quiet, peaceful country like the UAE. He arrived in Abu Dhabi in 1974 on an assignment from the Gamma Agency to cover the oil boom here. Curious to learn about a country that had been formed just three years ago, he walked around Abu Dhabi capturing scenes of daily life and visited the other Emirates that had become part of the Federation. He also got the opportunity to photograph the late Shaikh Zayed Bin Sultan Al Nahyan, the founder of the UAE. Burlot’s images of the oil fields in the desert were published around the globe and went on to become iconic images of the early years of oil exploration in this region. But neither he, nor anyone else, realised the importance of the photographs of the UAE and its visionary leader that he had taken in its formative years. His historic photographs are now part of the archives of the Zayed National Museum. I have photographed many leaders... but Shaikh Zayed was unique. He was a charismatic and wise leader, and I can never forget his powerful gaze which reflected his strong personality and his humanity. A selection of those photographs is on display at an exhibition titled Time of Zayed organised by Alliance Française Dubai in collaboration with Abu Dhabi Tourism and Culture Authority. The show commemorates the Year of Zayed and marks the culmination of the Year of Emirati French Cultural Dialogue during which the strong historical ties of friendship and cooperation between France and the UAE were celebrated through various events. The show features powerful portraits of Shaikh Zayed, iconic images of Abu Dhabi’s earliest oil fields, street photographs and pictures of the celebrations of the country’s third National Day, as well as a few images from Burlot’s earlier visit to Abu Dhabi in 1965. The artist, now a sprightly 72, was back in the UAE for the opening of the show and spoke fondly about his experiences and memories from 1974. What was Abu Dhabi like in those days? It was the new capital of a new country and in a period of transition but nobody could have imagined how rapidly the city and country would transform from a tribal bedouin society to the modern, multicultural place it has become today. There was sand everywhere, a few low-rise buildings and no roads, with a policeman standing on an oil barrel directing the traffic. The beautiful corniche you see today was just a stretch of sand, where families would picnic by the sea. I think there were three hotels and one fast food restaurant. There was no television in my room at the Hilton and the only entertainment available was a theatre that showed Indian films. But the people were warm and friendly, and I always felt comfortable here and still do. What kind of moments did you capture with your camera? While I was waiting for my permit to visit the oil fields, I spent my time walking around the city taking pictures of the markets, fishermen, dhow builders and even farmers working on a farm in the desert. I attended boat and camel races and visited Sharjah and other cities to capture the landscape and way of life of the people. I regret that I did not understand the value of those pictures and some of them have been lost. 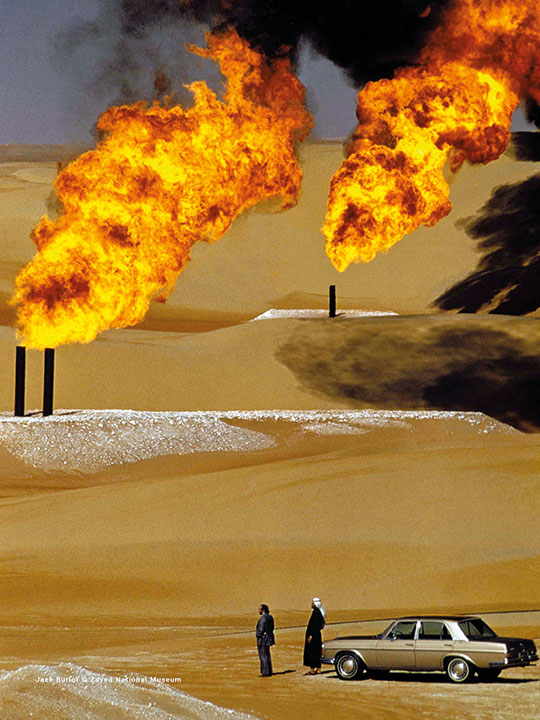 In the oil fields, I caught a moment when an Emirati and a Western oil executive were standing beside their four-wheel-drive vehicle watching the flares rise high over the desert. That image made it to the cover of 250 publications worldwide because there was global interest in the region’s oil industry. Is it true that you did a fashion shoot on the streets of Abu Dhabi in 1974? The idea came to me when I met a French model who was also staying at the Hilton. She agreed to pose for me and we shot at various places around the city such as the port and at Qasr Al Hosn. At a time when we hardly saw any women on the streets, people were astonished to see her posing for photographs on the streets, but nobody stopped us and many onlookers readily agreed to be in the pictures. How did you get those close-up pictures of Shaikh Zayed? It was at a camel race organised in honour of the Sudanese president. Security was quite relaxed those days and I worked my way closer and began taking pictures of Shaikh Zayed. He noticed this young, long-haired western photographer and looked at me, giving me the chance to get some good portraits. I have photographed many leaders such as Charles de Gaulle and Richard Nixon, but Shaikh Zayed was unique. He was a charismatic and wise leader, and I can never forget his powerful gaze which reflected his strong personality and his humanity. Did you get other opportunities to photograph him or talk to him? I made friends with members of his entourage and got accreditation to photograph events at the palace. They also invited me, but without my camera, for a falconry trip to the desert where I watched Shaikh Zayed at close quarters. I was young and only spoke French, so I hesitated to approach him but today I regret that I did not try to speak to him. Yet, I felt a connection with him. I do not know if he ever saw my photographs, but incredibly every time I returned to Abu Dhabi there was always a gift from him waiting for me in my hotel room. Time of Zayed will run at La Galerie, Alliance Française Dubai until January 12.